Overview - This neorealist masterpiece by Vittorio De Sica follows the daily life of an elderly pensioner as he struggles to make ends meet during Italy’s postwar economic recovery. Alone except for his dog, Flike, Umberto is determined to maintain his dignity in a city where human kindness seems to have been swallowed up by the forces of modernization. His simple quest to satisfy his most fundamental needs—food, shelter, companionship—makes for one of the most heartbreaking stories ever filmed, and an essential classic of world cinema. A booklet featuring an essay by critic Stuart Klawans and reprinted recollections by De Sica and Carlo Battisti, who plays Umberto D.
The cold machinations of society and circumstance can be cruel, working hard to strip us of everything we hold dear -- from our possessions to our relationships to our very homes, but people are often surprisingly resilient, bouncing back from adversity through determination and willpower. But what happens when the world tries to take that one last inch of strength? What happens when the world attempts to strip you of your sense of worth? Your dignity? Your very humanity? What happens when the world no longer has a place for you? A melancholic and unashamedly sentimental classic of Italian neorealism, 'Umberto D.' examines these very questions, and the answers it provides are heartbreaking. From acclaimed filmmaker Vittorio De Sica, the movie presents a realistic and honest portrayal of hardship and indignity, that eschews traditional drama for a more pure, unaffected portrait of human interaction. Umberto Domenico Ferrari (Carlo Battisti) is an aging pensioner in postwar Italy. Struggling to get by, Umberto is unable to pay his rent on time and grows increasingly desperate to earn money. With his callous landlady (Lina Gennari) threatening to throw him out, the poor old man gradually runs out of options, and the increasingly hostile world around him seems to offer no help. Joined by his loyal dog Flike, Umberto fights to retain his dignity, but the battle might simply be too much. Like most neorealist films, the movie deals heavily with socio-economic themes, illuminating the frailty of compassion and communication in an unfriendly world. Through Umberto's struggle, De Sica presents an intimate portrait of moral injustice and human tragedy. The script avoids sensational drama, and instead focuses on the everyday sufferings and activities of its protagonist, resulting in an honest peek into one man's gradual descent into despair, solitude, and indignity. For the most part, we simply follow Umberto as he attempts to pay his rent and keep a roof over his head. The character tries everything -- from selling off his belongings, to exaggerating an illness so he can stay in the hospital longer. Throughout it all, Umberto's escalating plight is handled delicately, slowly exposing the devastating realities of his situation. While the film can become quite emotional and somber, the sorrowful content is never overly manipulative. Instead, the director engenders a kind of honed in, concentrated air of sentiment that doesn't feel forced or over-the-top. It feels truthful and distressingly real. At first the character is determined to fight back against the many obstacles in his way, but eventually his once steadfast demeanor starts to dwindle. The manner in which actor Carlo Battisti layers his performance is simply incredible, and Umberto's gradual decline is utterly devastating. Battisti starts off with a palpable and almost cantankerous sense of frustration and fortitude, but this resolve can only last so long. When the character finally reveals the full extent of his absolute exhaustion -- not just physically, but emotionally -- the results are truly affecting. One close-up shot in the last act is particularly powerful, and the deep sadness hidden within Battisti's eyes transcends mere celluloid, leaving a lasting and profound impression. Bolstering the main narrative, is a subplot involving Umberto's fatherly relationship with Maria (Maria Pia Casillio), the apartment maid. Suffering from her own set of problems, Maria has found herself three months pregnant and is unsure who the father is. Umberto attempts to offer her some advice, and together they comfort each other as best they can, elaborating on the contrasting struggles faced by the young and old. Casillio is excellent in the role, exuding a natural aura that never seems artificial or calculated. This makes sense, since in typical neorealist fashion, both she and Battisti are actually nonprofessional actors. Together they create two fully formed and believable characters packed with heart and soul. 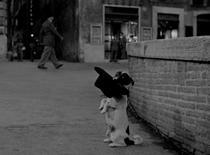 Of course, as strong as both human performers are, the real scene stealer here is Flike, Umberto's loyal dog. While recent films like 'Beginners' and 'The Artist' have had some pretty memorable canines, few four-legged characters can top Flike. The friendship between Umberto and his dog really does rest at the heart of the picture, and while some might find the pairing a bit schmaltzy, it leads to an incredibly emotional climax. Given the inherent power of the subject matter, De Sica mostly lets the content speak for itself, often employing a simple, purely functional aesthetic. This helps to further the film's realistic tone through an unobtrusive lens focused on the mundane and commonplace. With that said, the movie is still home to several striking shots, and De Sica occasionally sneaks a kind of understated poetry into his images. As Umberto's harrowing situation grows more bleak, the landlady prepares for his eviction by renovating his room while he's still in it. His own home is literally gutted around him, and at one point De Sica films the old man through a hole in the wall, slowly pushing the camera in closer, heightening his despairing solitude. Another scene ends with Umberto descending down a stairway, and the shot holds for a moment after he exits the frame. Reduced to nothing more than a lingering shadow on a wall, he is no longer a man, even in the eyes of the camera. This kind of restrained visual poetry subtly creeps into the picture throughout and when combined with the film's elegiac score, bolsters the modest, realistic atmosphere with very tiny hints of mournful lyricism. Considered by many to be the last film of the Italian neorealist movement, 'Umberto D.' is a truly heartbreaking piece of filmmaking and an enduring testament to the power of cinema. De Sica's storytelling is emotional but extremely honest, with a palpable, unfiltered sense of reality and a delicate air of subtle poetry hidden within its images. A tearful lamentation on loneliness, despair, and fading dignity, the movie tells the simple story of an old man and his dog, trapped in a hostile world that no longer has a place for them -- but, like all great works of art, the movie has carved a spot all to itself, cementing Umberto and Flike a permanent home in the storied annals of film history. 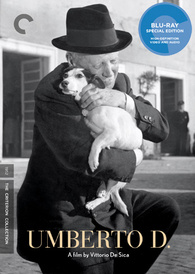 Criterion presents 'Umberto D.' in their standard clear case with spine number 201. The BD-50 region A disc comes packaged with a booklet featuring an essay by critic Stuart Klawans and recollections by Vittorio De Sica and Carlo Battisti. The film is provided with a black and white 1080p/AVC MPEG-4 transfer in the 1.37:1 aspect ratio. Though quite impressive at times, there are a few small issues here and there. While the main title sequence is a bit rough, the rest of the source print is in nice shape with only a few specks, scratches, and vertical lines present. A light to moderate layer of natural grain is apparent throughout, giving the image a pleasing filmic quality. Clarity is often very strong, and there is an impressive level of fine detail in faces, objects, and especially clothing, with tiny intricate patterns clearly visible. With that said, there are a few odd shots here and there that look comparatively soft, murky, and rough. Thankfully, these instances are few and far between. Contrast is high with slightly blooming whites, and blacks are deep and inky throughout. Negligible pulsing is apparent in a few shots, but isn't a real distraction. I did detect a hint of shimmering and edge enhancement as well, and while not ideal, they're quite subtle and most won't be bothered by them. 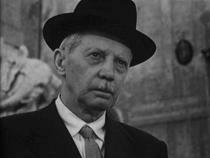 With a sharp image that carries a pleasing sense of depth and pop, 'Umberto D.' looks very good on Blu-ray. A few shots are a bit rougher than others, and there is some very minor edge enhancement, but for the most part, this is an authentic and even impressive looking transfer. The audio is presented in an Italian PCM mono track with optional English subtitles. Comparable to similar mono tracks from the same time period, the audio is solid but limited. Dialogue is clear but carries a slightly thin quality. The elegiac score actually demonstrates decent range but can strain in the high frequencies. Effects work is all handled well in the single channel, and the modest design work comes through nicely. Thankfully, I did not detect any major crackles, pops, or hissing. The mix is basic and limited by its age, but the audio still sounds authentic and is free of any major technical problems. Criterion has put together a slim but informative collection of supplements including an interesting documentary about the director. All of the special features are presented in upscaled 1080i with Italian Dolby Digital 1.0 audio and optional English subtitles. That's Life: Vittorio De Sica (HD, 55 min) - Made for Italian television in 2001, this is an interesting documentary that traces the director's career. Made up of vintage interviews and behind-the-scenes footage, the program details the director's transition from commercial films to neorealism, and then back to more mainstream productions. Through vintage clips, the director actually hosts most of the documentary himself, letting him detail his career personally. The long running collaboration between De Sica and screenwriter Cesare Zavattini is also touched upon, and we are treated to a few interesting conversations between the two filmmakers. Though the program doesn't go as in depth as I would have liked, it does provide a decent surface examination of the director's storied filmography. Maria Pia Casilio (HD, 12 min) - This is a very interesting retrospective interview with the film's female star that was conducted in 2003. Casilio discusses how she was discovered by De Sica and elaborates on her initial reluctance to become an actress. She also details what is was like to work with the director and shares some fun anecdotes about her career. 'Umberto D.' follows the heartbreaking story of an old man and his dog who struggle to survive in a world that no longer has a place for them. A classic of the Italian neorealist movement, the film is unflinchingly honest and unashamedly sentimental, in both form and content. There are some very minor issues with the transfer, but the video presentation is strong overall. The audio mix is limited by its age, but still sounds authentic. While supplements are a little slim, the included documentary and interview are worthwhile. This is a beautiful film and a very solid disc. Highly recommended.